From Bio: Adelaide. There’s no time to wallow in the mire. If you do you’re just gonna get sucked away. Sucked up north through the city’s decaying fringe, past the closed Mitsubishi plant, past Snowtown, past Port Augusta and into the dry red nothingness Bad//Dreems know this. That’s why they got together the summer before last, sweating out their hangovers in a warehouse next to the West End Brewery. 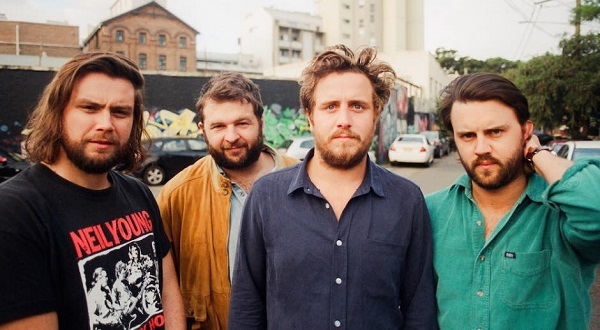 Bad//Dreems have a sound, which draws from the Australian underground of the late 70s and 80s, while also taking cues from US indie outsiders like The Replacements and Wipers. Mundane meets morbid; the humdrum meets the horror; nostalgia meets nightmare. Big dreams meet bad dreams. Despite the darkness and neuroses that Badlands explores, there remains a stoic optimism. You can’t afford to wallow here. Times might be bad but there’s something better around the corner. The schooner’s still half full. We’re here because you’re heading out for a run of shows, and for someone who hasn’t yet seen you live how would you best describe a Bad//Dreems show? Like a poorly choreographed ballet about the true story of Adelaide’s first male synchronised swimming team and their rise to glory. Your new album ‘Gutful’ has been out now for just over a month, how has everything been since its release? Pretty good. It’s doing good business on BitTorrent and Pirate Bay by all accounts. Some people seem to like it. Now, for someone who hasn’t picked up the album, let’s say you’re a door to door salesman, what would be your best sales pitch as to why this is the greatest album they haven’t yet heard and why they should grab it immediately? I will tell all the Jehovah’s Witnesses to come doorknock here if you don’t buy. This being your second album what if anything did you do differently this time around compared to making the debut? Slightly more 70s slant to the production. More parts recorded live with less overdubs. Your video for ‘Feeling Remains’ is outstanding, took me back to my growing up. Whose idea was to revisit Recovery? Thanks. James (bass) has this idea and it was great fun to make. Especially the Dylan Lewis bit. In being a band now for five years what have you learned in your time together about being in a band that you didn’t expect would be a part of the whole thing when you started out? So what’s at the top of your list that you haven’t yet had the chance to do as a band that you’d love to tick off? Touring Europe, Japan and more of the US. In saying that, you’re supporting Midnight Oil in October in Adelaide, how much of a buzz is even just thinking about that? A massive buzz. They are incredibly important to us. It’s hard to believe we’re almost half way through, but what does the remainder of 2017 have in store for the band? Splendour in the Grass, Yours & Owls, a few other festivals and probably recording a new album.